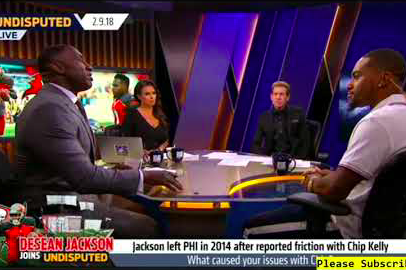 DeSean Jackson appears on FS1's "Undisputed" with Skip Bayless and Shannon Sharpe. NFL fans and observers have rightly marveled at the way Howie Roseman and Doug Pederson managed to steer the Philadelphia Eagles to a Super Bowl victory just two years after former head coach Chip Kelly left the roster and locker room culture in ruins. No former Eagle was more swiftly impacted by Kelly's high-handed abuse of power than Bucs wide receiver DeSean Jackson, who was cut from the team in 2014 amid hazy media reports connecting him to gang members from his youth in southern California. At the time, Jackson told ESPN the Magazine that while he knew gang members and associated with them from time to time, he never belonged to a gang. From a football standpoint, Jackson was cut after a career year in which he racked up 1,332 yards and nine touchdowns in Chip Kelly's offense. He was the first of several players from the Eagles core who were released over the next few seasons. Most fans have moved on from that Eagles era with a lasting appreciation for the excitement and promise it once held. Winning Super Bowl LII with a completely revamped roster and coaching staff was ultimately worth the pain of losing the team's previous stars, from the perspective of a championship-starved city. But if you're Jackson or LeSean McCoy — even if you know the NFL is a business like any other, and have happily moved forward in life — there's plenty of reason to look back at Kelly's dismantling of the team with some disappointment. After the Eagles beat the Patriots on Sunday night, Jackson took to Instagram with a temporary post flashing the words, "Chipmunk Kelly a bum." He then congratulated the Eagles in a tweet. On Friday morning, Jackson joined Skip Bayless and Shannon Sharpe to discuss his reaction to the Eagles championship parade and how he looks back on his final season with the team under Chip Kelly.